Owner Clifford Foster setting up a raccoon job. 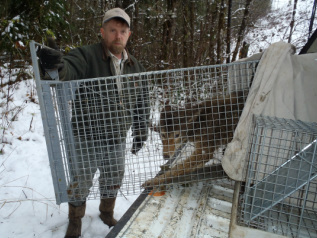 CCP Wildlife Control was founded in 2009 by Clifford Foster, Wildlife Control Operator certified by Oregon Department of Fish and Wildlife. Clifford has over 30 years experience in animal damage control work and personally handles every job to completion. We are located out of Hillsboro, Oregon but handle any animal or pest problem state-wide. Some common issues we deal with are dead animal removal, skunk odor removal, and bird in vent removal. CCP uses humane management methods in the capture, removal, and prevention of animal damage problems. We provide services for residential and commercial customers, including the Hillsboro Water District. No job is too big or too small. We work with each customer individually to provide a personalized solution to the animal problem. We offer years of experience and approach each job with the goal of finding a permanent and humane solution. Unlike larger companies we have the ability to offer a stable and reliable service provider giving you the assurance and ease during the animal removal period. Clifford Foster personally handles each call and sees the jobs to completion.